← Southern Cambodia: Kep, coconut pajama ladies, & the Khmer Rouge. From Phnom Penh it was a northward journey towards Laos. Before leaving I caught the Seahawks vs Carolina playoff game with a few other Americans at an Irish pub along the river. It’s strange watching a game at eight in the morning. After watching the pounding they gave Carolina I hit the road in great spirits not knowing what lay ahead. 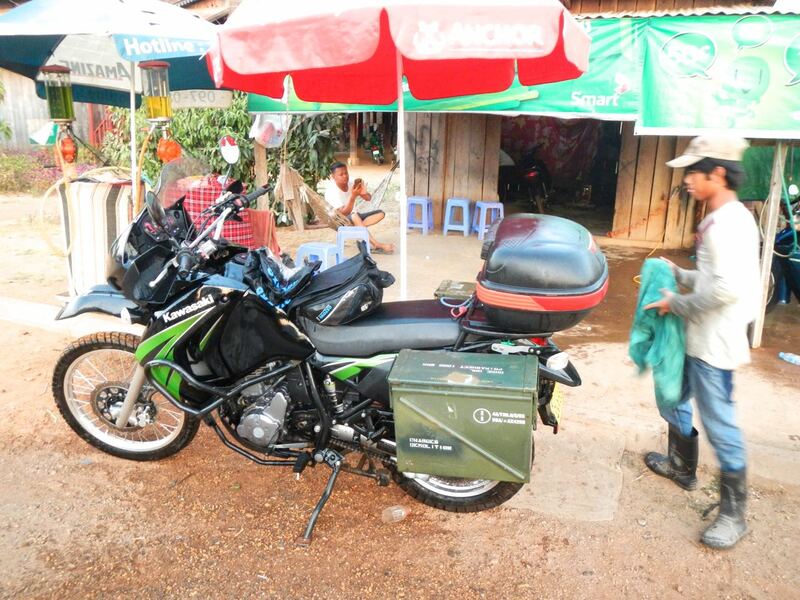 Another time in Cambodia I had done Hwy 7 by motorcycle so I decided to try a new route to see something different. In hindsight it might not have been the greatest idea, but I didn’t know at the time that the 170km of Hwy 6 that I was taking would be under construction. It’s the main road from Phnom Penh to Siem Reap (where Ankor Wat is) and someday it will be very nice, but for now it’s dust heaven. Down a side road I found some water buffalo that know how to enjoy a nice meal while cooling down from the heat. There were tons of flowers in a pond and the buffalo were slowly strolling through munching on them. They didn’t eat the greens, only the purplish-white flowers and buds. They looked pretty funny with just their heads poking up out from the thick vegetation. Luckily at Krong Steung Saen I was turning to the north and getting on a nice paved road. It wasn’t too fun bouncing around and dodging potholes for 170km, but the worst was the dust. I’ve never been so dusty in my life. It’s red and creeps into every inch of your everything. In the little town I found a hotel room for three dollars, and it wasn’t bad. It was impossible to get all that dust off of me with one shower. I showered off a bunch of my gear as well. The room even had a TV with english stations, and I was able to watch one of the playoff football games. Found a local guy with a corner street restaurant that spoke some english and spent the night hanging out with him and giving his kids mustaches. I had been using my smartphone for maps, but halfway through Thailand it just wouldn’t turn on. In Bangkok I bought a new cheap little Asus tablet with GPS that I could download free offline map apps with. I don’t have to be attached to any internet to use the maps. They are ready to use with my GPS and do a pretty good job of keeps me from getting lost most of the time. I can also preload a section of googlemaps and then use in when I’m offline. I would love a good paper map, but haven’t been able to find any yet. Anyways, apparently google stores all your information from your android devices and when you log into a new tablet with your same google account it downloads all your apps. My favorite apps all appeared onto my tablet. Mustache booth, beauty booth, and bald booth. They bring me so much pleasure back home, and the fun continues over here. The best part of Cambodia for me are the kids. They bring so much energy and excitement, but a lot of the time you need something to break the ice because they’re terrified of you at first. One of my favorite things to do is bring out the tablet, which automatically gets their attention, and then bust out mustache booth. I’ll have one of the kids pose for a picture and then give him a mustache. This gets them all laughing wildly and convinced I’m an alright dude. The fun doesn’t stop there and we go to town with some baldness and beautifying. At this point they are still a little scared of me, but let their guard down enough to have some fun. They’re always very interested in what I have in my cases and no matter what I pull out they’re fascinated. They just like to see how they open and close. I have a toy snake that I bought at the snake temple back in Penang, Malaysia, and I get people all the time with it. Sometimes when I pull up somewhere and get a little crowd around me, I freak them out with it. They’re all interested in what I have in the case so I tell them to wait while I find something. It’s a small snake that looks real when I have it across my palms and jiggle it. Everyone goes running and screaming until I show them it’s fake, and then they start laughing and making fun of each other. All through northern Cambodia I had a lot of fun stoping and meeting the kids. Most of the time they just congregated to me as soon as they saw the bike. I had to go to a mechanic before leaving town and have him re-weld a spot on my pannier frame that had developed a crack. The ammo cans are like armor for the bike, but the few times I let the bike fall over were hard on the frame. It took me a couple days to reach Stueng Treng, the city about 30 km from the Laos border. On the second day, I was going along and saw an old couple with a little kid along the side of the road with what appeared to be a broken down scooter. Whenever I see someone looking like they have a problem with a moto I stop to see if they need any tools since I have almost anything they could need. His foot stand was really loose and just barely hanging on, and he was trying to tighten it with a wrench 5 sizes too small. I took out my socket set, and he reached right in and grabbed the right size first pick. I was impressed. They were very grateful and I hoped I’d earned a little good karma from it. Later on in the day I went exploring off a side road to a village. Between the time I first went down the road and when I came back, they had laid down a layer of something on the road and then heavily watered it. I’m guessing it’s a soil full of clay so once it dries it will be hard, but when I came over it it was slippery slime. I didn’t expect it going about 40 km/hr and it flung me sideways a couple times until flinging me over. I probably looked pretty silly all covered in mud. Luckily the mud was nice to my bike and the engine guards did their job. I was worried about the fresh weld, but it held up fine. A little mud never hurt anyone. Of course it was a day I decided to wear shorts so i banged up my shins. I was wondering where my good karma went. It was just waiting for the right time. About an hour later I ran out of gas. It’s the first time I’ve run out of gas on the trip. I knew I was really low, but wanted to reach a station so I didn’t have to buy it off the side of the road. The bottles they sell at stalls is the lowest quality and I don’t like to put it in my bike. I was in the middle of nowhere, but luckily ran out right in front of a families house. With sign language I asked if they had gas, and she said no. I grabbed a chunk of bread out of my case and started munching on it, and then here came the man of the house on his scooter to go get me some gas. It took him about fifteen minutes to get it and he tried to give me my change back. I gave it to him for a tip. While he was gone I met the whole family. The good karma found its way to me just when I needed it most. 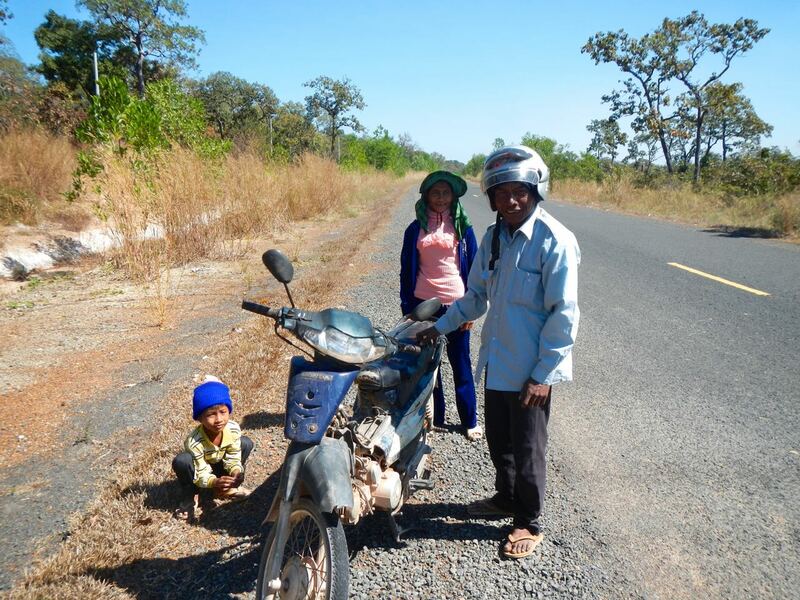 The landscape of northern Cambodia is nothing to write home about. Most of its just sad to see. It looks like they’re on a mission to tear down every last tree to make way for grazing land and plantations. A lot of it is freshly torn down and fires smolder along most of the route. After they get what wood they want out of an area, the rest is burned. Its really ugly and everywhere has brand new shack/houses built with the new timber. Once I got to Stueng Treng I was on a mission for one thing. Before I got to have a shower and get cleaned up, my bike needed some love. After making it from Australia through Malaysia, Thailand, Cambodia, and the last few days filled with dust and mud, he deserved a bath. I found a little shop at sunset with a hammock out front to wait in. For $1 the two guys gave it a complete wash and scrub. Definitely the best one dollar I’ve spent on the trip. One of the guys really enjoyed washing the ammo cans and spent a lot of time detailing them. 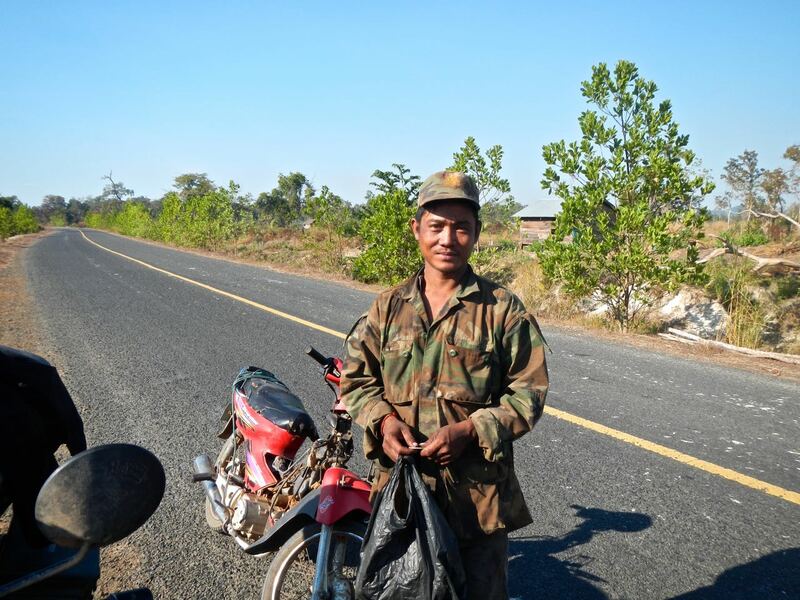 With most of Cambodia scrubbed off of the motorcycle, my time in the country had come to an end and in the morning I would follow the Mekong river north towards Laos sparking in the early morning sun. Goodbye Cambodia. 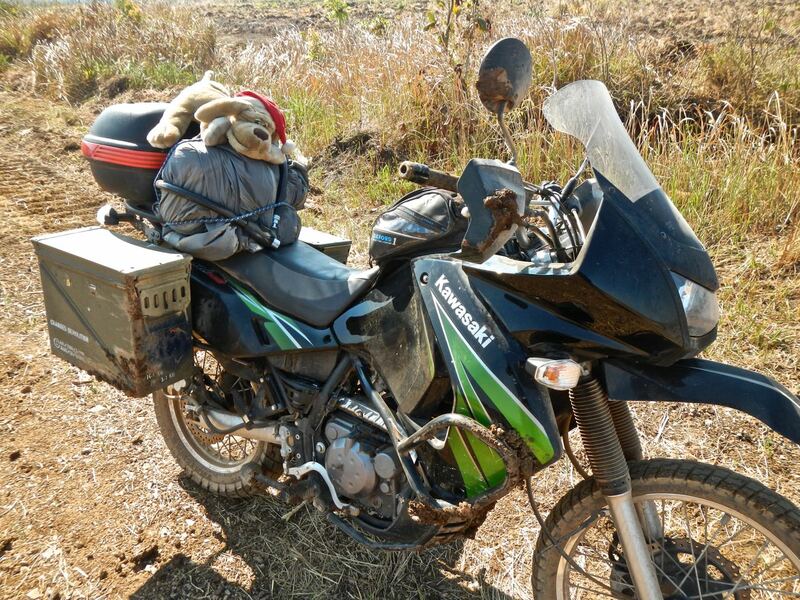 This entry was posted in Cambodia travel, Kawasaki KLR650, locals, Motorcycle world travel, Photography and tagged adventure, cambodia, crash, dry, gas, kids, landscape, locals, motorcycle, northern, petrol, red dust, travel, wash. Bookmark the permalink.